Lindsay has led flora and fauna surveys for over 20 years. 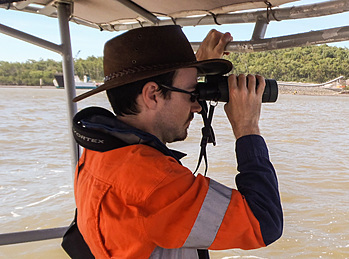 He is experienced in ecological impact assessment, flora and fauna monitoring, species management plans, habitat modelling and ecological project management. He also has specialist expertise in the identification of insects, birds and eucalypts, as well as acoustic recording and identification. Lindsay is a Certified Environmental Practitioner (certification number 803). In addition to his broad ecological expertise, Lindsay is an internationally recognised expert on Australian cicadas. Many of the skills and work methods applied to his work on cicadas are relevant to surveys and assessments of flora and vertebrate fauna. Prior to joining NRA, Lindsay worked in a variety of roles, including as a research associate in plant molecular phylogenetics at the Australian National University, as a Curator of Entomology at the Queensland Museum and as a Senior Ecologist at a consultancy specialising in terrestrial ecology.